Ancient water ice is hidden on the surface dotted around craters on the Moon’s poles, scientists have confirmed in a paper on Monday. The idea that the Moon carries water has long been suspected, but never directly observed. Scientists have relied on studying its mineral content to deduce that water does exist on its surface and in its crust. Now, a team of researchers from various US universities, including the University of Hawaii, University of Colorado, and NASA Ames Research Center have identified “direct and definitive evidence for surface-exposed water ice”. 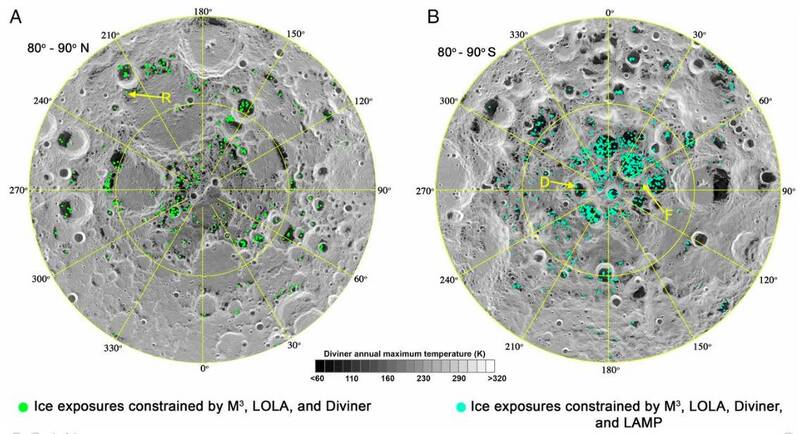 The South Pole appears to have more water ice clustered near deep craters than the North Pole where it is more evenly distributed. Spots of water ice highlighted on the North Pole (A) and South Pole (B). Image credit: Li et al. The researchers dug into data taken from Chandrayaan-1, the first lunar probe launched by the Indian Space Research Organisation in 2008. Chandrayaan-1 carried NASA’s Moon Mineralogy Mapper (M3) instrument to map the chemical properties of the Moon. It found areas that were highly reflective, where the molecules absorbed a distinctive measure of infrared radiation, allowing the researchers to pinpoint it as water ice instead of liquid water or water vapour. The temperature of these patches was also below 110 kelvin or -163.15 degrees Celsius, where sunlight never manages to illuminate because of the Moon’s small axial tilt. These spots are described as cold traps in the paper published in the Proceedings of the National Academy of Sciences of the United States of America. Permanently shaded from the Sun, the cold temperatures means that water ice may have built up over time. The Moon is hypothesized to have rotated on its current axis two to three billion years ago, and the scientists reckon that not much ice has accumulated since. It means that the observed ice is probably very old indeeed. Simulations suggest that a layer of frost may last no longer than twenty million years on the satellite’s surface. “However, it is unclear whether the solar wind bombardment, galactic cosmic rays, and the interplanetary medium UV can cause substantial loss of ice over the geological timescale,” according to the paper.